← IX. the third idea – Universal Studios Singapore. X. the preparation before USS. 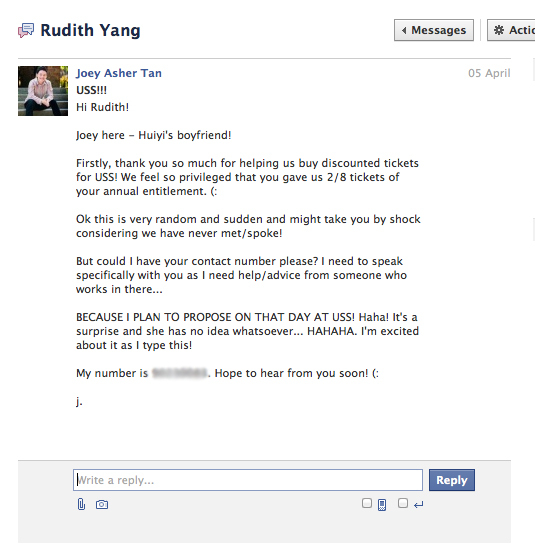 Looking back to before the recce trip, I remember asking Cheryl about her recent experience at USS. She was the one who told me about the Pavilion and how the sun set beautifully over there. That actually prompted the site visit. She even sent me some of the photos she took at the Pavilion when she was there. It was important that I saw it for myself. I also consulted Joel, who visited USS with Cheryl (and two others). Both of them gave me insights into what I would expect at USS as a visitor. 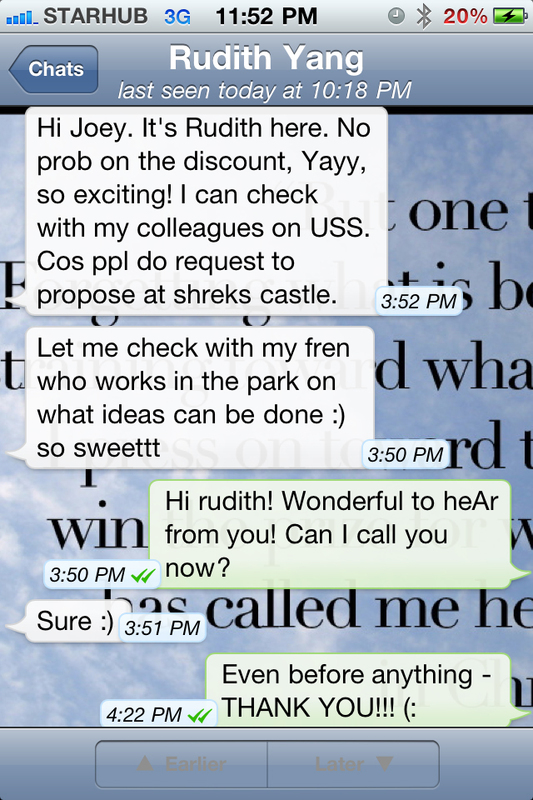 Rudith however, could provide real advice on what I could or couldn’t do in USS, since she worked there. So I took the liberty to randomly and suddenly message her via FaceBook. And within an hour, I received her reply via WhatsApp! I explained to her why I could not add her as a friend on FaceBook and that our communication would have to be discreet. Normally, Huiyi has full access to everything in my iPhone (since I have nothing to hide) but in those crucial weeks, I was cautious whenever I texted or received a message from someone. I couldn’t afford to give it away due to a careless mistake of concealment. Next chapter: the red tape that I couldn’t clear. Posted on July 23, 2011, in A Walk To Remember, Picture Perfect and tagged Cheryl Ng, Joel Tay, Lee Huiyi, Rudith Yang, Universal Studios Singapore, WhatsApp. Bookmark the permalink. 2 Comments.